When the Museum opened in 2010, it offered a spectacular view of Independence Mall. But the view of Independence Hall on the Mall was spoiled by scaffolding. The Independence Hall Tower, where the Centennial Bell hangs, was undergoing a much-needed renovation. Among the repairs were the replacement of glass in the clock faces; co rroded iron rods were swapped with stainless steel; a paint job; and a regilding of the weathervane. 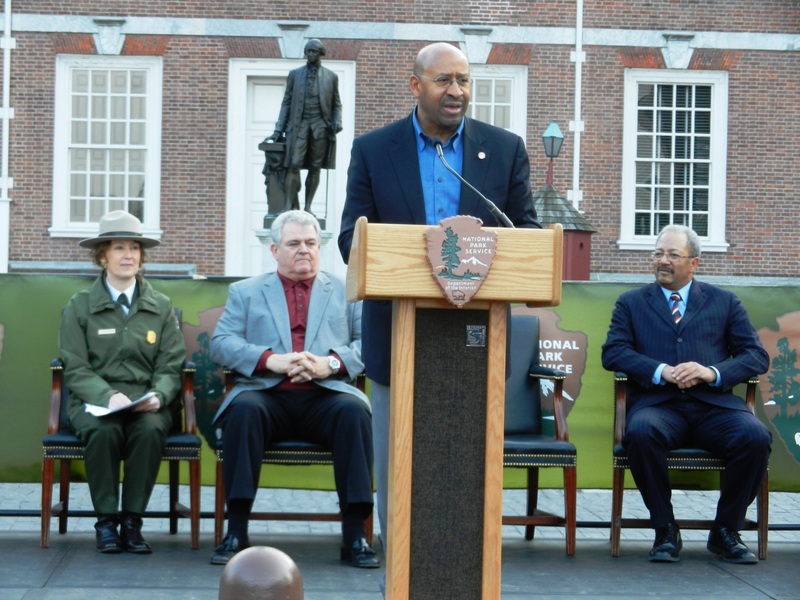 In a recent ceremony that featured Independence National Historical Park Superintendent Cynthia MacLeod, Mayor Michael A. Nutter and Bob Brady and Chaka Fattah, both members of Philadelphia’s congressional delegation, the tower was declared rehabilitated and the silenced bell inside chimed anew. When you are visiting the Museum and the Mall, make sure you check out Independence Hall. It’s a spectacular sight.